Recording: Amateur Traveler Podcast, episode 35. Chris: Welcome to the Amateur Traveler Podcast. I’m your host, Chris Christensen. Today in the show Budapest, Hungary. Flight Steward: The cabin has been pressurized; in the unlikely event of sudden loss of cabin pressure, oxygen masks will descend from the ceiling. Stop screaming, grab the mask and pull it over your nose and mouth and breathe normally. Yeah, that’s going to happen. Chris: And now as promised, an interview with Eric who lives in Budapest to tell us about that city. I’d like to welcome on the show Eric, who I’m talking to in Budapest, and brought him on the show to tell us a little bit about life in Hungary. Welcome, Eric. Chris: We’re also dealing a little bit with a delay from here to Hungary, so it’ll be interesting to see how this turns out. So you have been in Hungary since September and you actually spent last year in Slovakia. Eric: In the Czech Republic. Chris: I’m sorry; I’ve got the wrong one. In the Czech Republic. And you have been teaching English over there. Eric: Yes, that’s correct. I teach English to maybe 50 teenagers. I teach about 21 hours a week. Chris: And what’s the biggest thing you notice that’s different between . . . you’ve lived in the U.S. obviously most of your life, and you’re now living in Budapest itself? Are you in Buda or are you in Pest? Eric: I’m in Kispest, which is kind of the run-down area of Pest. It’s very communist. Eric: Very, I call it the concrete jungle; block housing, lots of graffiti, not the nicest neighborhood at all. Chris: Okay. And I assume you’re being put up from the organization you’re working with; they found you an apartment in that area? Eric: Yes. The apartment I live in is actually owned by the school, which is convenient because the school I work at is like an eight-minute walk from here. Chris: Okay. And what’s the first difference you’ve found in living in Hungary versus the U.S.? What’s the first thing you noticed? Eric: Public transportation. Most Hungarians don’t own cars, so the public transportation, the subway, the trams, and the buses are absolutely amazing. And so, coming from America I’m used to being very, very defensive when I’m traveling. I don’t like people cutting me off, or if you get too close to my car I’m uncomfortable. But when you get on a bus you can just kind of turn your head off and go to your own world, which is fantastic for me. Chris: What’s the best surprise you’ve found in living there, the best fringe benefit of living in Hungary for awhile? Eric: The best thing in my opinion about Budapest is the baths. Eric: The Turks took over Hungary in the 1600s and they found these natural hot springs, and they put up these large public baths. The Romans did it first in like the 200s, 300s, but then the Turks really took care of it, so they have these huge baths, and you can pay $10 and sit in a mineral bath or a hot tub for the entire day. They have saunas, which is also my first sauna experience, which was a very strange thing. Jumping into that cold water is really refreshing, but it takes a lot of courage to do it. Chris: And what’s the flip side of that? 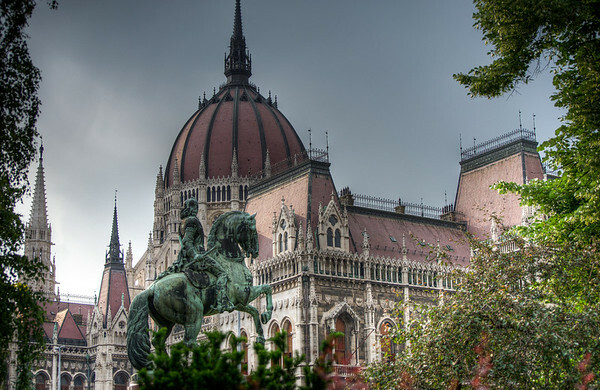 What’s the thing you miss most about being in the U.S. or really wish Hungary would discover? Eric: I really miss American football. That hurts a lot; that’s painful. But you know, I’m entering a season where the Niners aren’t so great, so maybe it’s good I’m over here. Pizza is very different also, but that’s the Italian; they have very thin pizza. And I don’t know, I like the deep dish. And being able to talk to people whenever you want. There’s not a lot of English in my neighborhood, so I’ve become a master of charades. But I guess that’s what happens when you go to different countries. Chris: Now before you went there did you speak any Hungarian, some Hungarian; you didn’t speak a lot for sure? Eric: I don’t think anyone speaks really good Hungarian. Hungarian is I think ranked as the most difficult language to learn in the world. It’s closely linked to Mongolian, because the Hungarian people are the Maja people, are nomadic people that started over in Mongolia and [gotcha] about the 800s. So they’re not closely linked to any of the other languages around them. And it’s absolutely ridiculously hard to figure out. The words are far too long. It seems like they’re trying to push as many syllables into a word as possible. And they have like a strange word combination thing. For example, there’s a city called Szekesfehervar, which is one word and this means the castle with the white chair inside of it. Chris: Okay, so tourism. My show is about people coming over and visiting, not necessarily people living for a whole year usually. Does that pose big problems for people who come over, or is there enough English to get around; or do you just recognize things by how many syllables they have? How did you learn to adapt? Eric: If you stay in the center of Budapest you shouldn’t have any problems. Sometimes I go to the center and I only hear English. There’s a big tourism industry in Hungary. I think typical throughout Europe you’ll see lots of British bachelor parties, where you see like 12 or 13 English guys drunk and singing. And British people love singing. So they’ve kind of, I don’t know, developed a tourist industry around these singing drunk British people. Chris: Okay, there’s an interesting mental image forming there. So you’ve had visitors come over and visit you; I think your folks came over and saw you while you were there. Chris: And where do you go, where do you take visitors? What’s the best thing to see in Budapest or thereabouts. Other than drunk British people singing? Eric: Hungary has a fantastic wine region, Julien, which is to the south. So wine tasting is very popular. Also Hungary has some really interesting architecture, because Budapest was actually . . . well, Hungary hasn’t won a war in 600 years. So they were conquered by the Turks, so there’s a lot of old Turkish architecture around, which I think is very interesting. They were conquered by the Hapsburgs and the city was almost destroyed then. So there’s a lot of Venice architecture also. And they are also one of the few cities in the world to get the dubious honor of being bombed by both sides in World War II, because they originally sided with the Nazis. So most of Hungary was destroyed and then rebuilt up, so there’s a lot of this very old gothic classical architecture that’s been redone again. So it’s very beautiful. The building here are just unbelievable, specifically the castle, Buda Castle, which is also an art museum now. Chris: That would be the other side of the river from where you are? Eric: And then there’s Szent Istvan Cathedral, which was built only 100 years ago, which is new for a cathedral. It’s a very interesting place, because Szent Istvan, who was the second king of Hungary, you can pay $.50 and go into the cathedral and see his severed hand, which is relic. Chris: Okay. Is that now an orthodox church, Catholic Church? Eric: I think it’s Roman Catholic. Chris: Okay, I don’t know what the background is in Hungary. Chris: Okay. That would make some sense. And what do you do, what is nightlife like in Budapest, if you’re not a British tourist on a bachelor party? Eric: Budapest, my students do a lot of clubbing. I have a few students every Thursday morning who will go to clubs and when the club closes will come directly to school. There are lots of discos. But what is kind of typical, and what I enjoy doing, is you can just go to a pub, buy a local beer, because everything foreign is much more expensive. And you just sit down and talk for a while. And there are lots of places to do that. There is an opera, an opera house in town. And Budapest is interesting because it’s one of the few cities I’ve ever been to that’s really on fire for choirs. Choirs will sell out billings, and they’re classical choirs, too. Chris: Oh, that was my question, what type of choir are you talking about. Interesting. Eric: Hayden sells out. Last night I was walking through the city and I stopped in the park and I heard a string quartet playing. They really enjoy their classical music here. Chris: Interesting. And the food in Hungary? My perception as an American is that it’s goulash, and I don’t even know what goulash is, but I don’t really know what Hungarian food is like. Eric: Goulash, which is very different from the goulash I grew up with as my Mom was cooking it, is a thick soup. Eric: It’s a stew. And I don’t know, sometimes I like it, sometimes I don’t. Hungary doesn’t have a lot of trade as far as vegetables go, so the food here is really dependent on the season. Eric: They are famous for paprikash, which is their red peppers. So they like their food a little bit hotter. Yeah, lots of cabbage. Chris: Spicy cabbage, okay. What else stands out to you in your experience here in Hungary? The winter I’m guessing is not the best time to visit Hungary? Eric: Well, this winter has been the worst winter I can ever remember. It’s like my soul is missing; it’s been going on for six months. Let’s see, there’s Margaret Island which is in the middle of the Danube. And that’s one of my favorite places to go, just to walk around. It’s a park now, like the Central Park, but it also has ruins from a 12th Century abbey. So you can just walk around, walk your dog, enjoy the spring. And then there’s an abbey and it’s kind of strange. I really enjoy it. Chris: You were telling me about winter. Eric: Oh, winter. Yes, you know, spring’s going on. You can see the flowers. I don’t know, getting out of Budapest is important, because I think there are a lot of beautiful countryside out here. It’s very flat; actually it’s a rolling hills deal. I feel like I’m not being . . . oh, yeah, the wine regions. A family will own the wine region for hundreds of years, and a lot of families have actually had to buy back their vineyards back from the communist government. And so what you can do is you can go to a small town, like Pecs, which is spelled P-E-C-S. Or you can go to Ager and you can just take a tour and go from these small wine basements to the other wine basements and have a brief selection of whatever they offer. The most famous wine is called Tokaj, and this is a dessert wine. And it’s white, it’s from sweet grapes. They’re very proud of their wine around here. Most Hungarian dishes are served with alcohol. If you don’t get a beer or a glass of wine with it, people might look at you like you’re a little strange. Chris: Anything else people should know if they’re heading to Hungary on vacation? Eric: I think that might be about it – make sure you get the baths in. Chris: Any difference in the people? Eric: The people… Traditionally people who under communist rule are a bit quieter and a bit closer to their families because you never know who was a communist spy. Hungarians, I think, are the most talkative of these. I’ve been around some other countries. Hungarians are talkative. There’s a lot of stereotypes about the Roma, the Gypsies. The stereotype being that they are all thieves and violent people. Some of my students have been assaulted by some of the Roma but there’s a lot of racist Roma jokes. They do tend to hang around the dirtier parts of town. I seriously thought of that as the Roma parts of town. There’s a sense of second class citizenship around here. People feel uncomfortable. Chris: I gather that’s a different ethnic group. Eric: Yes. The Gypsies Roma, they are people who immigrated from India over across Asia through Europe. They’re in pretty much every European country. I think Germany makes a big effort to turn them away at the boarder. Slovakia has cut away their housing funding. A lot of people are… they’re moving away from Slovakia now. Chris: I know when you were living in the Czech Republic, you were saying that one of the differences you saw was you had trouble, even though you were teaching adults, with people cheating in class even though the point of the class is to teach English. So I’m not sure what advantage cheating gives you. Is that an Eastern European thing? Was that a Czech thing and you don’t see that as much in Hungary? You said there was a Czech saying about if you were cheating. How does that go? Eric: If you’re not stealing from someone, you’re stealing from your family. This is an old Czech saying. I don’t know if it holds so true anymore. In Eastern European schools, in post-communist schools, it’s traditional that you’re in a group of 15 or 16 students and this is your class. Every class you have from kindergarten to maybe the eighth grade, you have with these same 15 students. So you develop a really strong bond with these students, because it’s not like America where you have Math with some friends and then English with a bunch of different friends. You are always with these 15 students. So they have a strong friendship. They will always cheat or they’ll always try to help each other. Chris: But in a cooperative sort of way. Eric: Yes, it’s cooperative cheating. Chris: I realize it’s the teacher that may not come across this positive, but not on a competitive sort of way. Chris: …in that culture at this point. Eric: Yes, I have to check all the desks to make sure there’s no writing on them. Girls will write on their thighs in pen and then sneak up their skirts to look at the answers. That’s when you always feel strange checking for. Chris: I could imagine that that would be awkward. Is there something that people run into outside the school environment? Is that something that’s a school thing? Do you have to capture change? Eric: You have to capture change which is traditional. A few times it’s happened to me. If you go to a bakery and they see that you are American or English and you ask for two rolls, they’ll automatically give you three just so they can up their profits a little bit. If you go to a tourist store and you give them a large bill and you don’t say to them what the change should be, you might find yourself short-changed. For example, I had a friend who went and she bought a blanket which was about 900 forint. It’s about $4. She gave the person 10,000 forint bill which is 50 dollar bill. The person only gave that change for 1,000 forint bill which was a five dollar bill. So she didn’t think on her toes and ended up losing $40. Chris: Now for equal time here, what’s the best thing you like about the Hungarian people? That’s not necessarily their best characteristic. What’s the best thing you like about them? Eric: Hungarian people are very charismatic. They are full of energy. They are full of life. They’re a bit louder than the rest of the people around them, but they… Budapest, it’s like a drug. It’s full of vibrancy. It’s exciting. There’s always something going on. It’s a beautiful city. It’s an unbelievably gorgeous city. I was walking through the streets just randomly because I like to walk around the city sometimes. I was thinking I was getting into a dark area. I walked into it. I saw this gigantic cemetery. It was such a gorgeous cemetery. The gravestones are just common as these wooden ones. I don’t know. It’s a fantastic place. Chris: That seems like a better note to end on than the other one. I thank you very much for your time, Eric, for spending time telling us a little bit about Budapest and about Hungary. Actually I should ask you this before you leave. What’s the correct pronunciation of the city. Chris: Okay. I’ve been saying that and I wasn’t sure if I was saying it right. Thanks very much for coming. Chris: I have three new stories for you today. The first one is more of a personal nature. If you read the April edition of the National Geographic Traveler Magazine, you will note that there’s an article about podcasting and it happens to mention the Amateur Traveler Podcast. So thanks to the National Geographic Traveler for printing that mention of the show. The second story is from the San Jose Mercury News. There’s a trend to ban smoking that is taking hold in Europe. Coming from the United States that’s a real relief, if you happen to have a family that as sensitive to cigarette smoke as mine is. Links to that in the show notes at AmateurTraveler.com. The third story is a press release from a company called PoshAir.com that is planning on selling sleeping bags to fliers on long flights. So even if they take away your blanket you’ve got this little lightweight sleeping bag you can zip up in and then sit in your seat. It’s not just a long flight, it’s a slumber party. Chris: Well I’m so glad that I could finally have Eric on the show. I actually tried to get Eric on the show before he left for Budapest last summer to talk about his time last year in the Czech Republic, but it didn’t quite work out before he left town. So if you have any questions for Eric, feel free to send them to me and I’ll forward them on. And there’s a picture of him in the iTunes Enhanced version ladies, and yes, I believe he is single. In the internet resources part of the show I have two different things that I want to tell you about. The first one is just a site that caught me eye called Footscape, and Footscape is a site that does walking tours of the Dorset coast in England. And a lot of the walking tours that I’ve seen tend to be a very expensive tour. Quite often $3,000 a week and then you’re doing all of the walking, but they’re still carting your luggage from one hotel to another and then providing you a guided walking tour along the way. This particular site provides walking tours that are self-guided using the survey maps of England and well-marked trails apparently, as well as guided walking tours, and so the cost is about a third of the cost of the other walking tours that I’ve seen. So that’s kind of interesting, if you’re into a walking tour but you want to save a little money, check out that site on the show notes at AmateurTraveler.com I’ve got a link to that. The other thing that I’ve been wanting to tell people about for a while – I’ve got a little shorter show today so I’m going to do some housekeeping and tell you things that I’ve been meaning to tell you but haven’t – there is an Amateur Traveler Flickr group. And if you’re not aware of what Flickr is, Flickr is the site for instance where I pulled a lot of images for this particular show’s iTunes Enhanced version and I have a link to the Flickr gallery searching for pictures from Budapest. And you can join Flickr for free, and if you put your pictures up there you can also join the Amateur Traveler group and it’s a way for you to show other people who are also listeners of the show your pictures. Right now the group is I think just Nathan and I. Nathan is from Manchester. He and I set up the group some time ago and I just haven’t got around to telling anybody else about it. So that is something I’ve wanted you to know, and in the community section feel free to go to the discussion boards and post a comment about this particular episode or start other conversations or look at what else is going on in the discussion boards. So that’s the very first time that’s happened to me and a shout-out to Ann, who also has a Cafe Press store, for being the very first person to come up to me and actually recognize me who didn’t know me ahead of time. So that was particularly fun. I’ve also created a MySpace for the Amateur Traveler, so if you have a MySpace, feel free to link to either the Amateur Traveler podcast MySpace or the Chris2X MySpace – that would be my personal MySpace which will actually soon have links to some of the things in my designs and my store if you’re curious about that. So if you are a MySpace user, that would be someplace, a way for you to support the show. Speaking of supporting the show, I had somebody ask with within the last 24 hours, am I planning on putting up a donation button for the show? And I’m not. That is not something I feel all that comfortable doing, so it’s not that I’m opposed to making money on the show, I just don’t feel comfortable asking you for money. I think you should be spending your money on travel. But I would appreciate you supporting the show; there are other ways to support the show without sending me money. Obviously if you’re interested in a particular book that I’ve featured in the show notes and you want to buy it through the link that I put up there in Amazon, that gives me a couple dollars. Or if you see any travel deals on the right side on the AmateurTraveler.com, I’ll get a small cut – a really small cut – for some of those, so I may even take those off. And then I will be adding advertising to the show, as I did say I have been lining up an advertiser for the show. In fact, here’s your first sample of the show’s first advertiser. Male Voice: It’s the most refreshing beverage ever created. It’s cool. It’s completely clear with no calories, no carbs, no fat, no kidding. So the next time you are craving for a drink to satisfy you completely, choose the one people have been choosing for ages. Water. It’s what you’re made of. Chris: Consider that an early April Fools joke. Thanks to Steve from the SG show for allowing me to use that commercial that they did for a recent show. I’ll put a link to their show in the show notes at AmateurTraveler.com. I am still talking to a sponsor, but we haven’t yet worked out all of the paperwork. I’d love your feedback. Feel free to call me at the Amateur Traveler voicemail line, which the number is (408) 512-1083. Catch me on Skype at ChrisTwice, at Gizmo Project at ChrisTwice, at AIM at ChrisTwice, at Yahoo Messenger at Chris2X, or send me an e-mail at host at amateurtraveler.com. All of that contact information can be found in the show notes at AmateurTraveler.com. If you enjoy the Amateur Traveler, please subscribe so you won’t miss out on an episode, and please support the show by voting for it at PodcastAlley.com or at PodcastPickle.com, at Yahoo Podcasts. Links to all of those in the show notes, or fill out one of the two listener surveys on the site. Feel free to review the podcast at any place they review podcasts. For closing the show today, I couldn’t find a good song about Budapest or Hungary in any of the places I usually look, so I thought I would just make something up. Chris: Nevermind. Thanks for listening. Male Voice: The best and the brightest served up daily by the sharpest minds in content delivery, podshow, and limelight.